Loads of time between blogs at the moment. 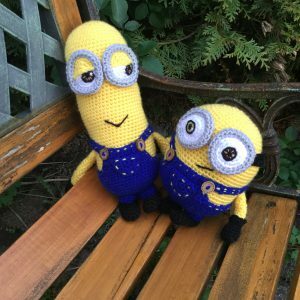 There’s just not much to blog about, crochet wise that is! I sort of made a deal with myself to focus on one project at the time, to get rid of the enormous pile of WIP’s or UFO’s (work in progress or unfinished objects) I have lying around. And some of them had a incoming deadline, so there’s an order to finish them in as well! First of was my ‘spur of the moment’ promise to two of my daycare boys. I had already promised a mermaid doll I had made previously to their sister for her birthday. It was only fair that they’d receive something too. So minions it was! This would be Kevin and Bob. I got the pattern from here. 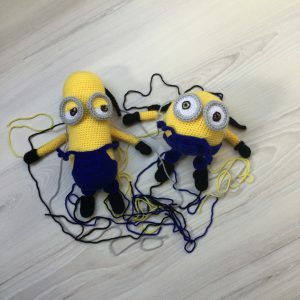 A very nice detailed pattern, with a great tutorial for embroidering the eyes! Then after that, and still working on that, would be the baby sleeping bag. I wrote about that previously here. It’s a very very big project, and deadline coming soon. I really hope I can finish it before the baby is born, so working very hard on that! 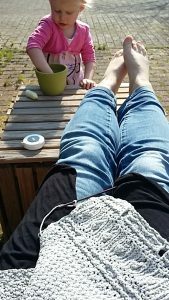 (Although I can’t complain when I can sit outside in the sun) There’s no time for other crochet stuff. 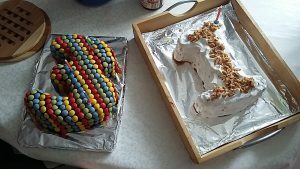 And last but not least, my little girls both had a birthday! 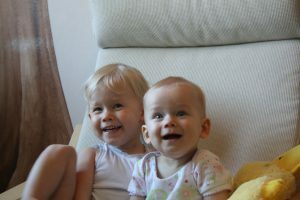 Emmy turning 3 and Izzy turning 1 year old. Big celebration and party!